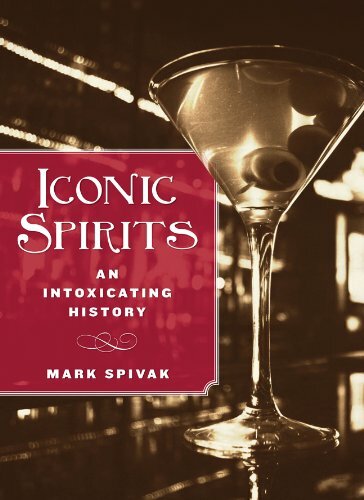 I am pleased to be reviewing Iconic Spirits: An Intoxicating History by Mark Spivak as part of his Iconic Spirits blog tour! If you missed it, he guest posted yesterday about The Sexiest Drink on Earth! If you've ever sat staring at a bar menu or all of the bottles lined up on the shelf somewhere and wondered how someone came up with that idea or how they decided that various spirits were worth drinking... this is the book for you! Combining fascinating history with iconic recipes, this book takes the reader on a journey across the world, from high society to backwoods stills and shares some great tidbits that will make you the life of the party and a sure-fire winner if the Origins of Spirits is ever a Jeopardy category. I personally liked the recipes and connections that this book made - and I heartily recommend it to anyone who has ever had a drink of hard liquor - or wants to! Mark began writing Iconic Spirits after becoming fascinated with the untold stories behind the world’s greatest liquors. As a writer, he’s always searching for the unknown details that make his subjects compelling and unique.His latest book is Iconic Spirits: An Intoxicating History. Visit Mark’s website at http://www.iconicspirits.net. Disclaimer: I received this book at no cost to assist with my review. All opinions are my own.